I mostly took the week off from the shop and taking photos and everything else that comes along with it. It was a refreshing break! I got lots of other things done like planting more flowers, organizing my office and getting a haircut. All the little things that I never really leave time to do. But that doesn't mean there aren't lovely things to be snatched up from the Etsy shop. 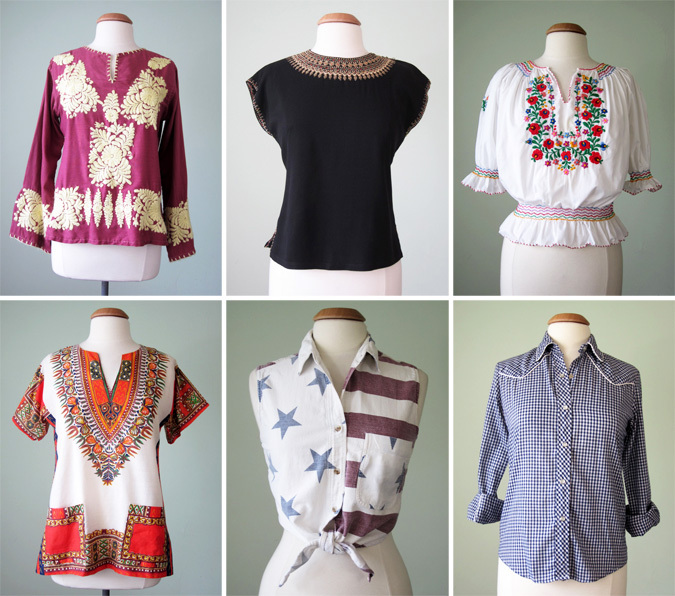 Here are some of my favorites that are still available. Apparently it's Fall Week here on the blog. Sort of like shark week, only with clothes? It wasn't intentional but here I am posting yet another fall collection. As soon as I saw a few of the looks on Starr's blog I knew I had to see more. It's my favorite so far! I love the whole urban explorer look with the ponchos and the hats and the boots (it makes me think of Elaine Benes and her urban sombrero). I'm also completely smitten with those brown ankle boots. I think they might lace up the back? Love! You can always count on Minna for wearable little black dresses in the fall and little white dresses in the summer. This year's A/W collection seems to be no exception. 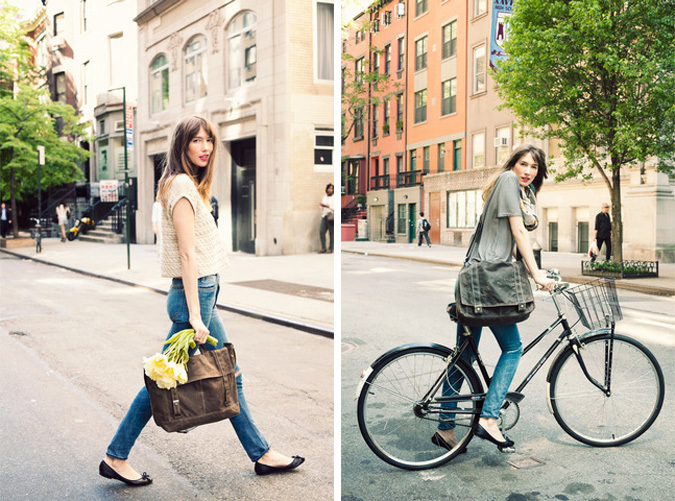 These looks almost have me thinking about wearing tights again, but for now I'm embracing bare legs. At first glance, you might think these are Swedish Hasbeens. You'd be wrong! They fooled me too. 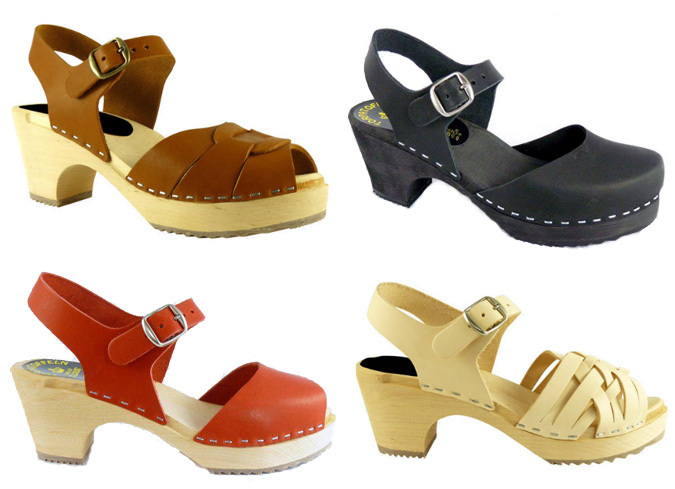 They are still Swedish clogs, but are offered from Lotta from Stockholm. I can never seem to find the open toed sandals in my size from Swedish Hasbeens but Lotta seems to have all sizes in stock. Plus, the price is quite a bit friendlier. I'm putting these on my summer wish list. The last few days have been, to put it lightly, unbearably hot. We're talking triple digit temperatures that take your breath away when you walk outside. So what better time for fall collections to start making their way into stores and onto the internet, right? For the most part I've been turning a blind eye because I'm just not quite ready for summer to be over. The memory of winter hasn't faded enough yet. But! If those jumpers from Dear Creatures are in my future, perhaps I won't mind it so much after all. I've just finished updating the Etsy shop for the week and you'll find some real gems in this batch. Some of the pieces are a step away from the usual things I add to the shop but it's nice to branch out sometimes, don't you think? This week's update was inspired by my sister's month long journey through Europe! I'm not even sure what country she's in right now. ;) It got me thinking about all the faraway places I'd like to visit. Tom and I have some pretty exciting plans for next year but I don't want to say too much and jinx it. I hope you find something in the shop to inspire your travels! I've just seen the photos for the Filly fall/winter collection and I'm pining for a day by the lake, lounging in a canoe and hanging out with the geese. Although this is a fall collection and consists of pretty fall appropriate hues in amethyst, amber and charcoal, the aesthetic of the whole line is so unfussy and wearable it translates well into every season. Also, the model's sunglasses are perfect! 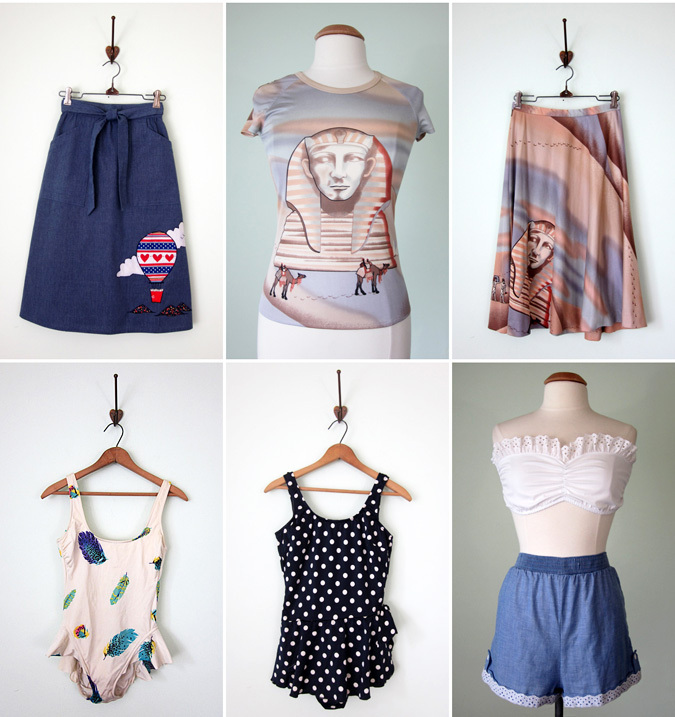 I'm so excited to be participating in a collaboration with Modcloth and Dear Creatures. The good folks at Dear Creatures have taken some of their favorite silhouettes and made them in new and exclusive colors to be available only at Modcloth. So far this dress is a one-of-a-kind sample but if it receives enough votes, it will be available this fall for everyone to have! It's really an adorable dress that gives off good sailor vibes without being costumey or over the top. It has a criss-cross back, sweet buttons down the side and red & black grosgrain ribbon trim. Love! If you'd like a chance to have one for yourself (I had to give this one back - I want one!) go vote HERE. These days I rarely leave the house without a tote over my shoulder. I'm amazed that I ever functioned without one as I find myself constantly putting it to use. 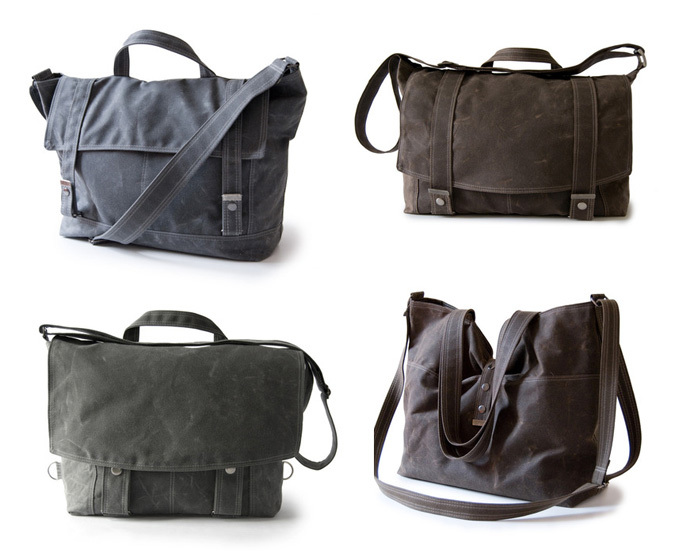 I really like these simple, utilitarian waxed canvas totes from Moop. They come in all sort of handy shapes and sizes and are handmade right here in Pennsylvania. 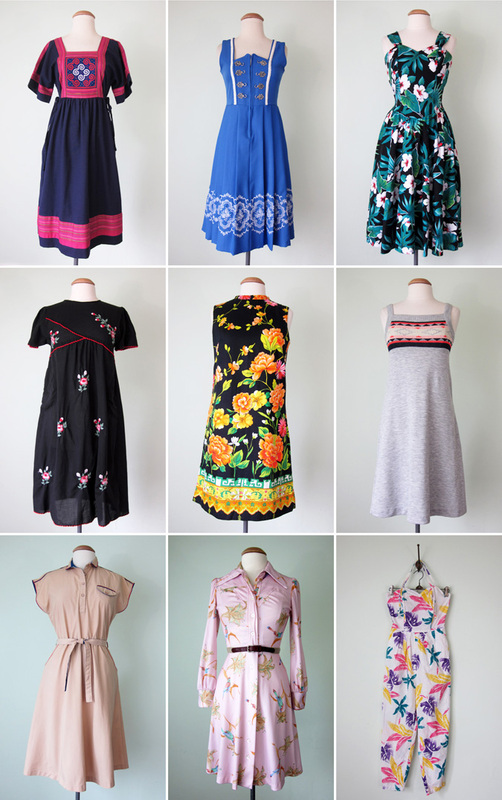 This spring/summer collection from Australian designer Strummer has lots of cute pieces that would be great for now and for later when the weather turns cooler. 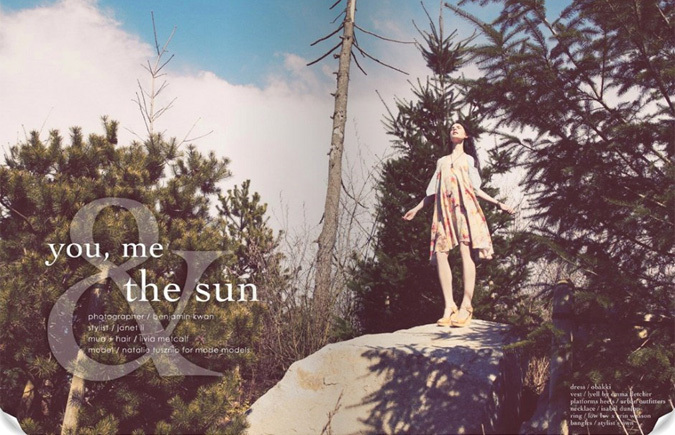 The collection, called Halcyon Days, was loosely inspired by 60s folk icon Vashti Bunyan. I think my favorite pieces are the silky yellow dress and cropped top/high waisted skirt. I thought that on this, perhaps the hottest day of the year so far, it would be appropriate to revisit the hottest place I've been all year... Palm Springs! We didn't stay in Palm Springs, just passed through on our drive to Joshua Tree. I love rounding the bend and seeing all of those windmills suddenly appear on the horizon like strange, gangly alien beings. Here's a look at the things I picked up for myself a week ago on a trip to the Adamstown flea markets and antique stores. 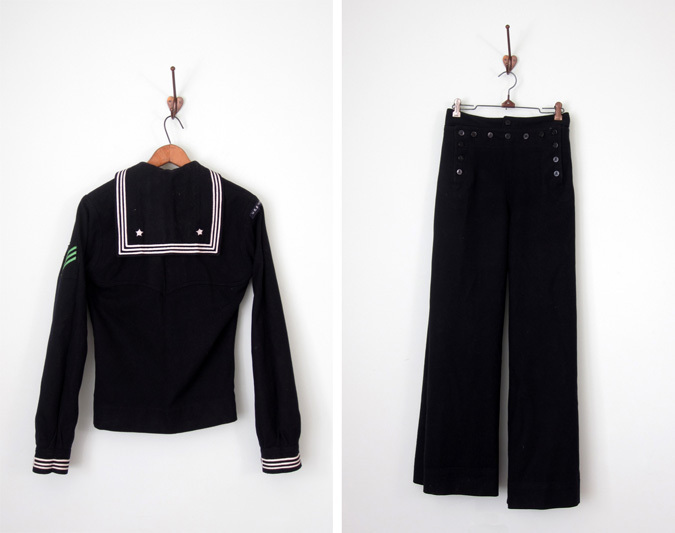 I think the one I was most excited about was this wool sailor suit. I still can't believe I found one in such a small size. The pants are a perfect fit! Of course the legs aren't the same length which I can't quite figure out but that will be an easy fix. The top fits well too although the one time I tried it on, I couldn't get it back off over my head by myself which made me feel super claustrophobic. Next is a 40s cotton dress in a brilliant sapphire blue. It doesn't look like too much on the hanger but it has the prettiest neckline and once I tried it on I knew if would have to come home with me. I also found that pretty plaid 70s skirt. I love the fact that it's earthy autumn colors in a summer weight cotton. My handkerchief collection was getting a bit out of control so I've limited myself to collecting ones with dogwoods only. I found two to add to my growing pile. The Edwardian slip will serve as the white maxi skirt that I've been searching for. And last but not least, a straw sunhat that I've been wearing everyday since. I've just finished listing this week's Etsy collection, inspired by all of the fresh summer strawberries that are beginning to hit the farmer's market stands. Aren't summer strawberries the best? 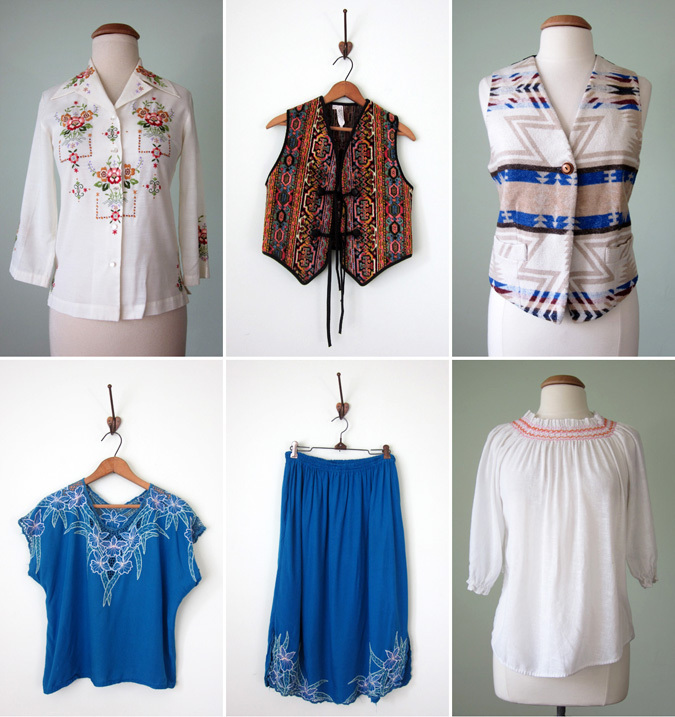 There are lots of lovely pieces in this collection; cotton sundresses, 70s skirts, pretty blouses and loads more. This past Sunday I headed up to Adamstown with Amelia to check out the flea markets. Our first stop was Shupp's Grove. I highly recommend visiting their website solely to listen to their rockin' theme song! I've tried to visit Shupp's in the past but it was always rainy or cold or something so this was my first visit. I loved it! It's outside but all in the shade so even on this hot July day it was pleasant to walk around. There are stands and stands of things to look at and just when I thought we had reached the end, we rounded a corner and it just kept going. Of course I got fussed at by a grumpy old lady for taking photos (someone please explain to me why flea market people are so fussy about photos - I really want to know!). I ended up picking up a couple of things for myself and one lovely 40s velvet dress that I'll put in the shop this fall. It was getting rather hot so instead of going to Renninger's to walk around outside we stopped at the Mad Hatter to take advantage of the air conditioning. That place is pretty vast too. It's always fun to visit the Memories shop because it's like rooting around through and old lady's attic who's been squirreling vintage dresses and hats away for decades. Again, I picked up a couple of things for myself (photos coming!) and Amelia found a couple of dresses as well. 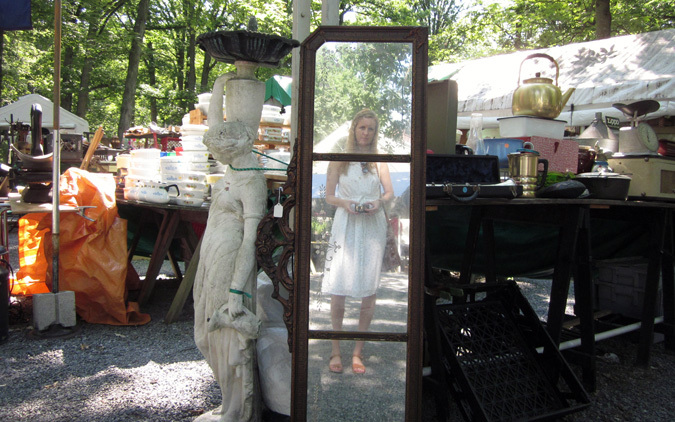 Then we made one last stop at Oley Valley Architectural Antiques. The purpose of this visit was not so much to buy anything but simply to oooh and ahhh at the massive furniture and doors stored in this place. I swear, as soon as we walked in my first thought was, "we're in the Room of Requirement!" With every corner we turned I was sure we were going to find a vanishing cabinet or a copy of Advanced Potion Making. I'm convinced most of the furniture came out of a castle because I can't imagine anyone having ceilings high enough otherwise. I was going to get a better shot of my outfit for this post after I got home. I had planned on using our backyard which is finally filling in with all the flowers I planted in the spring. Tom and I were sitting on the backyard swing relaxing for a bit when a catbird swooped in and landed on the trellis above us. They have really lovely songs like a mocking bird so we were excited he had joined us when... you guess it! He pooped all over my white dress. Ugh. Just my luck! So, no outfit photos in the backyard for now. Here's some fun, summer time photos from Cliche Magazine. Doesn't it seem like there are more and more good online magazines these days? I guess that's a good thing since they're accessible to anyone with an internet connection and there's no paper waste. These remind me of wandering around in the woods in Alabama and the sort of simple outfits I'd like to be wearing this summer. The other day I got an email from Tara-Lynn letting me know that her knit shop, Goodnight, Day (formerly yarnovermovement) was reopening with lots of new pieces that she was really excited to share. She was kind enough to send along some photos and info about her knits and I thought I'd share them with y'all. I've tried my hand at knitting before and just didn't have the patience for it, so looking at all of her lovely designs my head starts to spin thinking of all the hard work she's put into each one. The pieces are all hand knit by Tara-Lynn with techniques that allow as seamless design as possible. She uses super soft Merino wool that was hand spun and naturally dyed in Uruguay and lamb's wool that she hand dyed to give it an ombre look. I think my favorite piece is the welland lamb's wool hand dip dyed sweater. The hardest part would be deciding which color to have the sweater dipped in; peach, violet, grey, tan or teal? Be sure to visit her shop to see lots more of her work here or here. This weekend was spent going to Adamstown to visit the flea markets (more on that later), eating veggie burgers off the grill, watching a Harry Potter marathon (so excited for the last movie) and tending to my vegetable garden. How was your weekend? 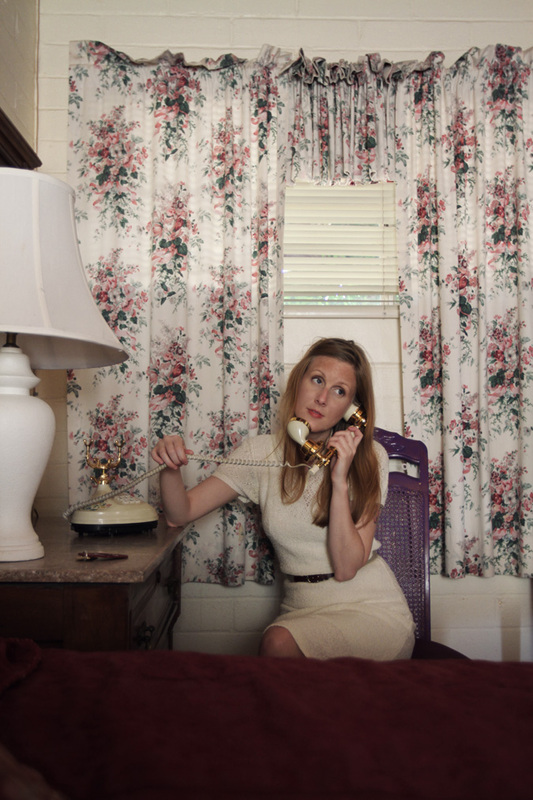 Here are a few more photos that we shot in our room at the Joshua Tree Inn. We were getting ready to go lounge by the pool for a while and watch the sun set. I'm not much for getting a tan so the pool at night is much more my speed. I ended taking a quilt from our room and falling asleep in one of the lounge chairs. I've just finished adding a new Etsy collection to the shop. This week I was inspired by the changing sky; one minute it's stormy and grey, the next it's bright blue and clear. The pieces run quite the gamut this week. 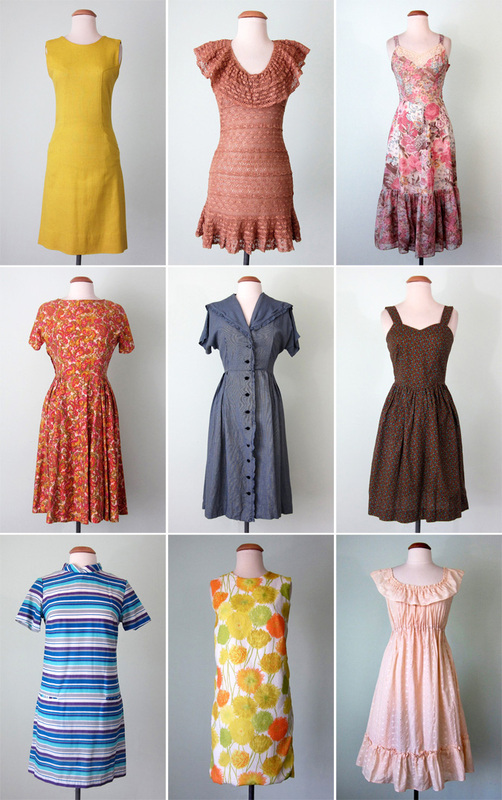 There's everything from 90s chambray shirts to 60s jumpers to 40s rayon dresses. I hope you find something you like! Some of our favorite time in Los Angeles wasn't actually in Los Angeles at all. 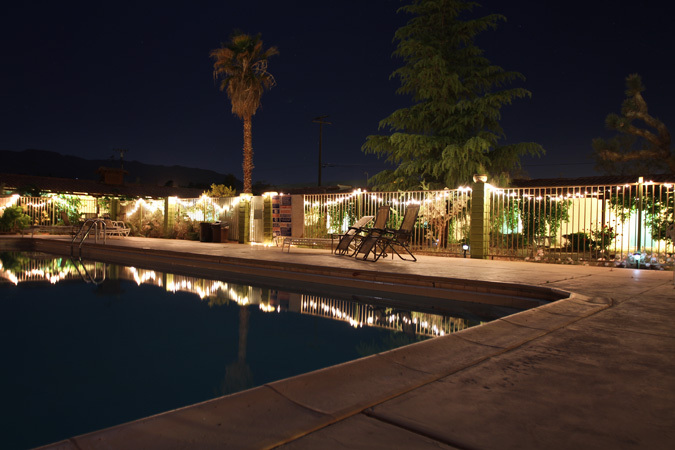 It was the time we spent in the Mojave Desert at the fabled Joshua Tree Inn. If you're not familiar with the inn, its claim to fame includes housing the likes of Keith Richards, Donovan, Emmy Lou Harris, the Eagles and of course, the inn's most famous guest Gram Parsons. In 1973 Parsons died of an overdose in Room 8 of the hotel. His friend, acting on Parsons wishes, later stole his body and took it into the Joshua Tree desert to burn. Crazy! If you like, you can actually stay in Room 8 but we wanted to stay in Emmy Lou's room, number 9. Upon our arrival we were greeted by the hippie innkeeper. After a brief conversation we realized that he was from Chester County, PA just a few miles from Lancaster. Small world! The rest of the day was spent being lazy in the room, reading, hanging out by the pool and taking some photos. These were taken in the room just before we headed out to dinner at Pappy & Harriet's. That place is pretty great. We ate veggies burgers and drank beer out of mason jars while watching The Americans play a rockabilly set. I don't know if you've noticed but I've managed to go at least a whole week without mentioning the weather on my blog. That has to be a record! The truth is, we've been having some really lovely weather for the past month. Highs in the 80s, lows in the 60s with mostly sunny skies and only a few showers at night. There's been nothing to complain about for once. That kind of weather calls for outfits are cool enough for the days and can be layered with a light sweater for evenings. Pretty much everything that you see in the Steven Alan resort collection! This really epitomizes how I've been dressing lately. Today Tom and I went scouting for some vintage furniture and knick-knacks for the house. I took lots of photos of things we're thinking about buying but none of my outfit. I'll give you a visual: vintage cutoff Levis 501s, a thrifted silk tank top, my Panama hat and sandals that I thrifted that look almost exactly like the ones in the Steven Alan lookbook. That's about it. Everyday. Happy 4th of July! There were lots of fireworks around here last night but we ended up staying in to cook dinner and watch a movie. That's typical of me... planning to go out but then staying in instead. I'm just a homebody at heart! 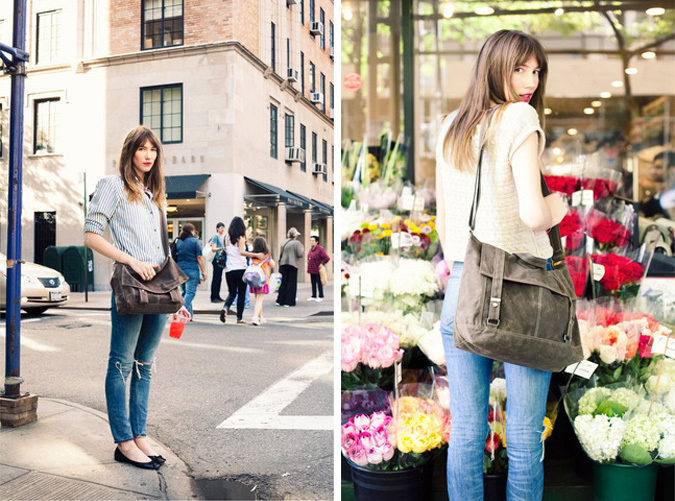 Here I am earlier in the week carrying around my new Field Guided tote. I finally caved and bought one after seeing them on so many other blogs. I'm so glad I did! It's a little bigger than my Mr. Fox tote and perfect for carrying around a day's worth of needs; my purse, a sweater for cool nights, any little things I pick up along the way. It has definitely been a regular presence on my shoulder since I got it. I don't usually pay much attention to resort collection but when I saw this one from Jill Stuart it occurred to me that every single piece was the perfect outfit to wear this Fourth of July weekend. Perfectly patriotic, nostalgic dresses with prints that look like fireworks! What more could a gal ask for? Tom and I will be attending the fireworks show at Longs Park for the Fourth. Do you have any fun plans? I really enjoyed this little video from Etsy about the Japanese shop Pass the Baton. 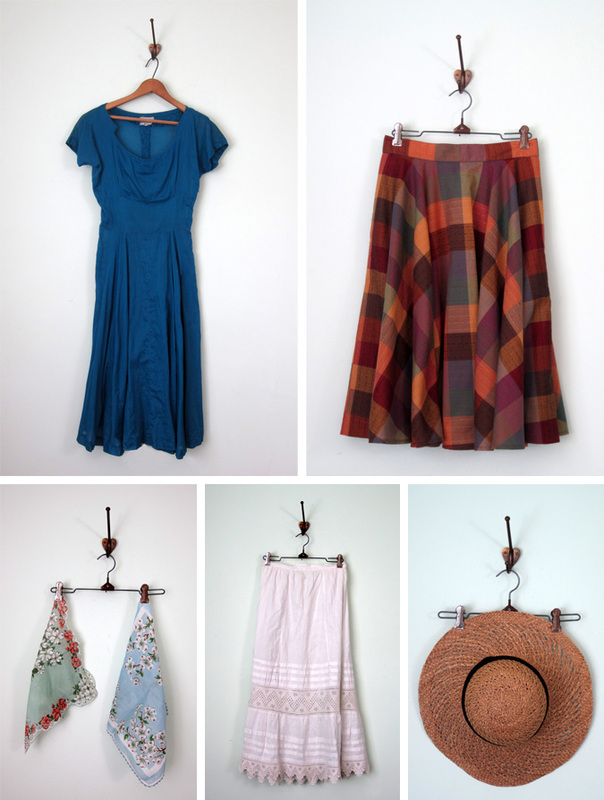 The owner's mission of passing along not only the item, but the story that goes along with it is a refreshing take on vintage and recycling. And he's wearing some seriously awesome glasses! "On June 6, 1968, in the midst of his campaign to be president of the United States, Robert F. Kennedy died from an assassin's bullet. Two days later, after a funeral mass in New York City, his casket was placed on a special train bound for Arlington National Cemetery. A journey that should have taken hours took all day, as thousands of Americans lined the 225 miles of track in a spontaneous outpouring of grief. 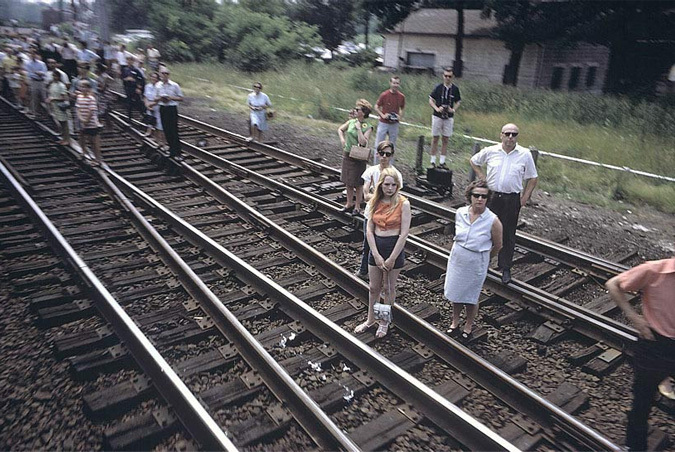 Paul Fusco was the only journalist on the train, and he ended up taking more than a thousand pictures from his window." I was completely transfixed watching the documentary and seeing these photos. Not to sound overly dramatic but these photographs are truly a moment in history captured on film; the looks on the peoples faces, the mix of races all standing together at a time when most people were segregated, the way the motion of the train left the photos slightly blurred and dream-like. I just can't stop looking at them.